More and more applications and hardware on boats can take advantage of real-time internet access. Having a live connection underway provides many advantages that will translate into increased success and safety. Here we will discuss why and how to have networking on your boat. Images and data from the web can be displayed in real-time. 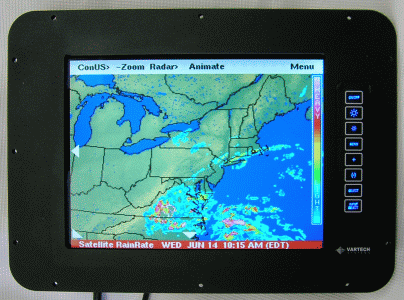 Examples include many kinds of weather data including GRIB files, weather buoy readouts and radar weather displays. When an internet connection is available, OckamSoft 5 can display these images without any human intervention or the need for an onboard computer. Networking is accomplished over Ethernet, which provides high data transfer rate of almost any kind. This means that real-time graphics and data can be transferred amongst the devices attached to it. Good calibration leads to more wins. However, it is a pain to do, and absorbs valuable resources. DeWiggler provides that extra crew member to help with this essential task. With a live internet connection, calibration can be accomplished remotely. With a live internet connection, your instrument system can be accessed from off the boat. Ockam provides the Tshooter expert application to allow real-time analysis. A cell router and modem provides total internet connectivity wherever the cell network can be received. The onboard network distributes the internet to the many devices that can make use it. Your onboard network certainly needs wireless ethernet to support mobies. However wired networks tend to be more reliable. So a combination of wired and wireless should be considered. If you don’t do offshore racing, then you should probably start off with a cell phone. Some cell connections are made via dongles that attach to your computer, and some are built into your phone – so-called hot spots. Read about how to set up an onboard network.